I use lemons a lot it my cooking I like the citrus flavour and often use it to flavour things in a heathy fresh way. I am a huge fan of fresh fish so fish is a must for me. Fresh soft herbs, I like basil and coriander and mint these are my favourites they give a real boost of freshness to any dish. 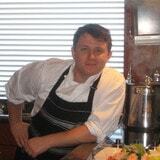 I became a freelance chef because I like the variety in my my work and I get to travel the world. If you believe this content violates or infringes your rights, William Dobson may not know. You could solve this problem by contacting him.